This is one to try for your next Sunday lunch. 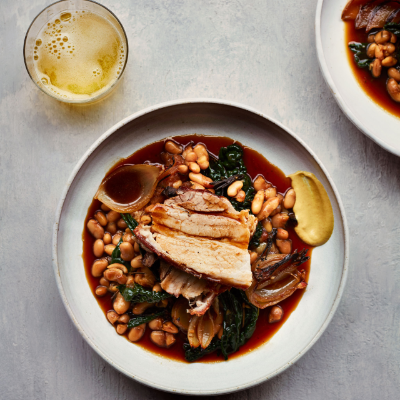 Classic flavours of pork, apple and cider combine with creamy cannellini beans and hearty greens for a delicious, comforting meal. Serve with a dry, crisp and fruity cider. 1. Preheat the oven to 160°C, gas mark 3. Pat the pork belly dry with kitchen towel and go over the scoring with a sharp knife making it a little deeper; season all over with fine salt. Put the garlic, apples, onions and rosemary in a roasting tin and sit the pork, skin-side up, on top. Roast for 1 hour 30 minutes. 2. Turn the oven up to 220°C, gas mark 7. Remove the roasting tin from the oven and spoon off any excess fat. Stir in the stock and cider, scraping up any sticky bits from the pan. Add the beans, then roast for another 30 minutes. 3. Lift out the pork and set aside to rest. Squeeze the garlic cloves into the beans and discard the skin, plus any apple skin and woody rosemary stalks. Stir the cavolo nero leaves into the beans and return to the oven for another 10 minutes. Slice the pork belly and serve with the beans and a dollop of Dijon mustard, if liked. If the skin on the pork isn’t crisp enough, put the pork on a foil-lined tray under a medium grill for a few minutes.